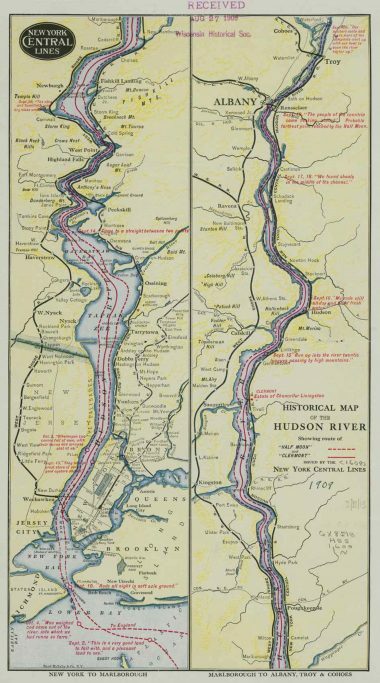 Eleanor’s Solo Sail « Hudson River Historic Boat Restoration and Sailing Society Inc.
Do you remember Hurricane Floyd? storm, please send them to us in our comments section. I was feeling that I was late in writing this letter to you, but I see in the files a letter written to all of you on Dec. 3 last year. Interesting is it not, that we are creatures of habit? The pull of the moon and the rise and fall of the tide. In retrospect, of course, if she had been anchored out at Greendale, all this would have been avoided, but we would have had to leave early on in the afternoon to avoid a run on flood tides. Frank and I checked the lines the evening of the flood and agreed that she would be all right. Little did we, or anyone else know what was to come. She would have been alright had not some powerful dock or boat rammed her, pulling off the cleats, separating the iron rings on the samson post, and actually bending the brass hardware on the standing back stays. The damage to the combing around the cockpit occurred when she hit ground and the boom chock dropped out) later to be recovered by Julie and Joe on the rocks along the shore) which caused the boom to crash down on the combing All in all, it was a stressful time. Thanks to Julie and Frank, Joe, Jerry , Dean, and the three muscle men. With the help of Mike at Riverview and Jack at Riverview we have a Mr. Glen Neil(4) from Catskill who has agreed to repair the Eleanor. He is very selective in the work he chooses to do, and we are fortunate to have him as our ship’s carpenter. He has watched the Eleanor over the years, and visited with Pop in the spring when Pop would work on the Eleanor, and hs is an old time wooden boat builder. On Thanksgiving Day in the morning, Mike, Robert, Frank and Joe covered up the Eleanor. I went over yesterday, and everything looks just fine and snug. Thanks to you all for doing that big job. Of course she has to be checked often to be sure the covers do not blow away, so if you go that way, stop and make a check. I am enclosing a copy of the statement from Mike for the hauling and blocking. Also, a copy of the check to pay the bill is enclosed. The original figure back in the fall that I sent you was $1008. The present bill is for $1123.20. Or a difference of $115.20. I do not know what I left out, but it is o.k. Phyllis, Mike, Frank and Julie each paid the $114 due from each owner. We are very fortunate that Beth and Bob are holding their interest in the Eleanor for one more year. Mom has contributed a great deal through out the year too. She continues to pay the insurance premium, and she put the Honda in running order. I used the Honda a lot last spring, and in the fall to haul the canvasses over to Catskill. During Arts Walk in Hudson Joe found an anchor in one of the stores which he purchased as a gift for the Eleanor. It is a big sea anchor, and replaces the deck anchor which was los in the flood. Joe is a member of the Hudson Power Boat Assoc. and has been a power boater for many years. He understands the river and its habits. He was a good friend to Pop, and now to us. And now, I am off to pay the bill and to put these letters in the mail. (1) Mr. Cesternino was the owner of the string of docks that lined the south side of the Catskill Creek for a number of years. While the Eleanor was docked there, he kindly kept an eye on her. (2) coaming – a vertical surface on a ship designed to deflect or prevent entry of water. It usually refers to a raised section of deck plating around an opening, such as a hatch. (3) chock – A fitting through which anchor or mooring lines are led. Usually U-shaped to reduce chaf. (4) Glen Neil was working independently at the time when he repaired the planking on Eleanor.